With so many power wheelchairs available today, choosing the right electric wheelchair for you may seem difficult. While the choices seem overwhelming, it’s important to focus on the power wheelchairs that best suit your needs. To narrow down your choices for a complex rehab power wheelchair, the first step is to request an in-person evaluation with a therapist. The therapist partners with an Assistive Technology Professional (ATP) who works for an accredited complex rehab technology company. During your evaluation, these individuals determine which electric wheelchair and components will benefit you the most. Working with the therapist and the ATP, you can select the complex rehab electric wheelchair that best suits your medical and quality-of-life needs. The first step is to choose a power base. There are two factors to consider when selecting a base: drive wheel configuration and weight capacity. Possible drive wheels configurations include front-, mid- or rear-wheel drive. The Edge 3 power base features mid-wheel drive and offers a 300-pound weight capacity. If you are looking for front-wheel drive, the 4Front® offers this configuration and features a 300-pound weight capacity. The Rival power wheelchair base offers rear-wheel drive and a weight capacity of 300 pounds. If your needs require a bariatric wheelchair, the Q6 Edge HD and the Q1450 are two options for a bariatric wheelchair power base. Next, the ATP and therapist will discuss your seating and positioning needs with you. Some individuals may only require a standard captain’s seat, while others may benefit from single power or multiple power. 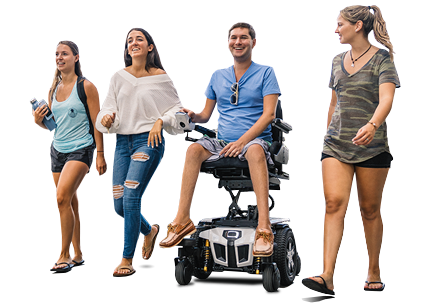 Highly adjustable, TRU-Balance® 3 Power Positioning Systems include options such as power tilt, power recline, iLevel® power elevating seat and a power articulating foot platform. Depending on your medical needs, TRU-Balance 3 offers an array of benefits including pressure relief, increased sitting tolerance and independent positioning and repositioning. When it comes to electronics on your motorized wheelchair, there are many options available. Q-Logic 3 Advanced Drive Controls is highly customizable and expandable, maximizing your independence. Q-Logic 3 is standard with Bluetooth®, allowing you to operate your smart phone or tablet using the Q-Logic 3 screen. Your ATP and therapist may also recommend a cushion from Stealth Products® wheelchair cushions to meet your comfort needs. Each cushion provides a different function, such as general use, and skin protection and positioning. The TRU-Comfort 2 wheelchair cushion is designed for both skin protection and positioning and features CoolCore® technology for added comfort. When choosing an electric wheelchair, it’s important to communicate with your therapist and the ATP to ensure your power wheelchair meets your needs.